But are those rules adequate? And will the UK be just a third country among others? Can the EU expect a significant British contribution to EU defence activities and could the UK therefore legitimately aspire to be given a special status? The question of working with third countries was raised as soon as the EU started to operationalise its Common Security and Defence Policy (CSDP). Third countries would bring capabilities that the EU lacks, as well as contribute to the political legitimacy of CSDP operations. More than 50 non-EU states have participated in CSDP operations since its first mission in 2003, including four regional powers – namely Turkey, Russia, Brazil and South Africa. Most of these contributions have been institutionalised through the signing of Framework Participation Agreements (FPAs), which address issues relating to the status of personnel and forces, the modalities of information exchange, the involvement of third countries in the decision-making process and conduct of the operations, as well as financial aspects. To date, 18 third countries have signed a FPA with the EU, and some of them, such as Turkey, Norway and more recently Georgia, have become key partners in CSDP operations. In practice, however, these mechanisms have not given rise to solid cooperation between the EU and third countries, which have often complained about the shortfalls of such mechanisms and their weak links to EU policy. Third countries invited to contribute to a CSDP operation are brought on board at a late stage and only given full access to EU documents once their participation has been accepted by the Political and Security Committee (PSC). Even once an operation is launched, their association through the existing mechanisms makes them second-class stakeholders. The Committee of Contributors (CoC) is a case in point: while supposed to act as a forum for information exchange between all contributing countries, it has a subordinate role, only meeting after the PSC and at a much lower level of representation. In fact, partnerships in security have never been a high priority for the EU. Existing rules and mechanisms focus on CSDP operations and are therefore ill-suited to any broadening of the EU’s security agenda. Those mechanisms are by and large incompatible with the shared objective of an ambitious partnership between the EU and the UK in defence, whose contours are expected to be laid down in a political declaration alongside the broader withdrawal agreement. 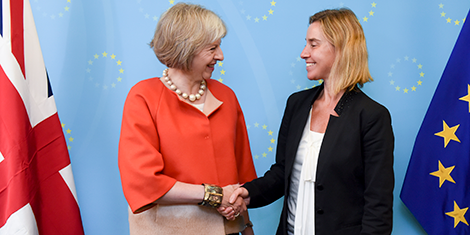 Will the UK contribute to the EU’s defence agenda? The form of future ties between the EU and the UK in defence are inevitably dependent upon the material mutual benefit of cooperation for both parties, and therefore upon the level of commitment of the UK towards the CSDP. The official British position on security and defence is quite ambitious about the possible scope of the UK-EU relationship post-Brexit, talking about a “deep and special partnership” that would go “beyond existing third country arrangements”. However, little in the recent past suggests the UK would seek much CSDP involvement once no longer a member: the UK has not been the most enthusiastic supporter of the EU’s defence agenda thus far and it would be paradoxical for this stance to change after Brexit. Here a distinction needs to be drawn between the European internal security agenda and the defence aspects: what is conceivable in security for the mutual benefit of all – and may even lead to a treaty – is more difficult to foresee in defence. Most importantly, scenarios under which the UK could seek to contribute significantly to a CSDP operation are difficult to identify, and have simply not occurred during the last 15 years. Recent developments in Permanent Structured Cooperation or the European Defence Fund may slightly change the way the UK perceives the EU’s defence role. But member states will first seek to consolidate any new initiative – which, paradoxically, may have become possible because of Brexit – before opening up to third parties. Furthermore, if the hypothesis that the UK and other European states would be willing to jointly conduct a military operation cannot be ruled out entirely, the chance that such an operation would be EU-planned and EU-led is not very high. Either the planned operation is at a lower level on the military spectrum, in which case the UK would most likely be unwilling to take part (as a continuation of past policy), or it is a more robust operation and then the EU would not be accepted as the institutional framework. Even the French European Intervention Initiative attests to this general reticence of going through the EU for high-intensity operations. Finally, any association with the EU in defence operations would be very hard to sell domestically in the UK. No matter how rational or mutually beneficial such an association could be, the government would inevitably be accused of collusion with the decried European Army of fantasy. Overall, given both the past and the current environment, there is consequently a significant gap between what is discussed in theory and what is conceivable in practice. Brexit takes place at a time when the EU is revisiting the form and scope of its security partnerships, with the objective of developing a “more strategic approach to CSDP cooperation with partner countries”, but also cooperation in areas that are not necessarily part of CSDP operations and missions per se. A post-Brexit UK can hardly be ignored in this debate. Officially, the EU position towards future EU-UK relations, as put forward by chief negotiator Michel Barnier in Berlin in November 2017, refers to an “ambitious partnership” that would be i) broad-ranging in terms of the kind of security issues it would encompass, ii) beneficial to the EU’s security and strategic autonomy and iii) balanced, in the sense that such partnership would not discriminate against third countries. Three red-lines were also reiterated: i) a third country cannot claim a status that would be superior to that of a member state, ii) the EU’s decision-making autonomy must be preserved and iii) any voluntary participation of the UK in European defence can only confer rights proportional to the level of this participation. Fair enough. The challenge is therefore to shape the EU-UK relationship so that it reflects both the EU’s prerequisites and the British level of commitment. An issue at the forefront of any debate on this topic is the precedent that would be created if the UK were given any preferential treatment: others – Norway and Turkey in particular – are likely to ask for the same conditions, provided they offer similar profiles. Either the EU accepts that the UK can be given such treatment and is prepared to explain this to other third countries with all the diplomatic risks that it entails, or the same treatment is somehow given to a selection of third countries, based on well-defined criteria. There are at least four reasons to justify a special relationship with the UK, the first being the political weight and exposure emanating from the UK’s permanent seat on the UN Security Council, which is an asset to the EU. Second, the UK will be the only third country that is also a former EU member. Third, the UK has military capacities that no European member state – bar France – possesses. And finally, there is the possibility to sign an information exchange agreement, which is not necessarily feasible with all third countries (namely Turkey, with which no information can be shared outside of the ‘Berlin Plus’ agreement). As of now, however, European states do not seem to be open to any kind of bespoke deal. In this context, one option is to revisit the EU’s security partnership so as to create new arrangements with a selected number of states that would contribute more than others to EU security activities. In December 2017, the High Representative tabled the idea of creating “a mechanism for closer and more constant coordination with the non-EU countries involved in our missions and operations”, adding that such a mechanism would be even more relevant as the UK “will leave the Union”. An upgraded FPA would presumably be offered to third countries already closely associated with EU defence activities. It could encompass a broader security agenda than just CSDP operations; but it would also offer an up-graded status vis-à-vis the EU by, for example, associating these third counties more closely with EU decision-shaping in defence. Discussions on whether the UK could be an observer in some EU bodies (such as the Foreign Affairs Council) will probably not go very far, but there are more realistic options, such as high-level consultation mechanisms with the first circle of FPA countries, upgrading the Committee of the Contributors to meet at a more senior level, or a closer association to the planning process of CSDP operations whenever a clear commitment to contribute is made. It would then be possible to envisage associations to the EDA, PESCO or even the EDF, but only along the lines of what is offered to all third countries. In any case, no special deal can be granted a priori; a closer association with EU defence activities can only be the result of a pragmatic and incremental approach that takes stock of actual commitments rather than pledges. And there will always be limits to what the EU is ready to concede regarding its sacrosanct autonomy of decision-making. Thierry Tardy is Senior Analyst at the EU Institute for Security Studies (EUISS) in Paris. The views expressed in this contribution are the author’s own and do not necessarily reflect the view of his employer or of CEPS. As an institution, CEPS takes no official position on questions of EU policy. UK always help their allies, They won’t turn back on EU as long as the EU respected the decision of UK’s people.